I finished a WiP (work in progress) yesterday, Hyrna með krónuprjóni is finally finished after 7 years (approximately 6.75 of those years it was in a bag). 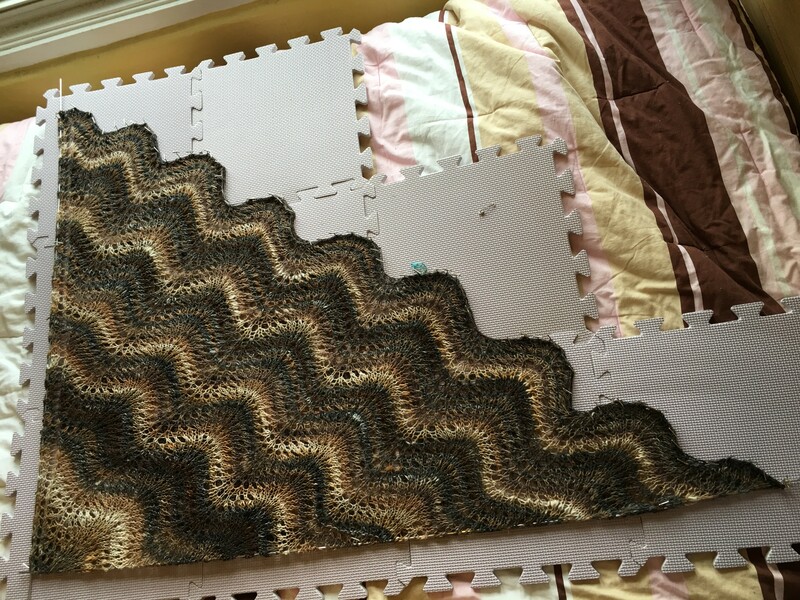 Now it is a FO (finished object). I will submit it to my Weaver’s Guild UFOFF (unfinished objects finally finished) Challenge Exhibit in a week and it will be on display in the guild gallery for a while beginning in May. Here is a pic of it before being blocked. After soaking in a little warm water and Eucalan wool wash, she needs to be shaped and pinned out to dry. I folded it in half for blocking to save space (along with my back–bending over and pinning it out takes a while) andto keep the symmetry. 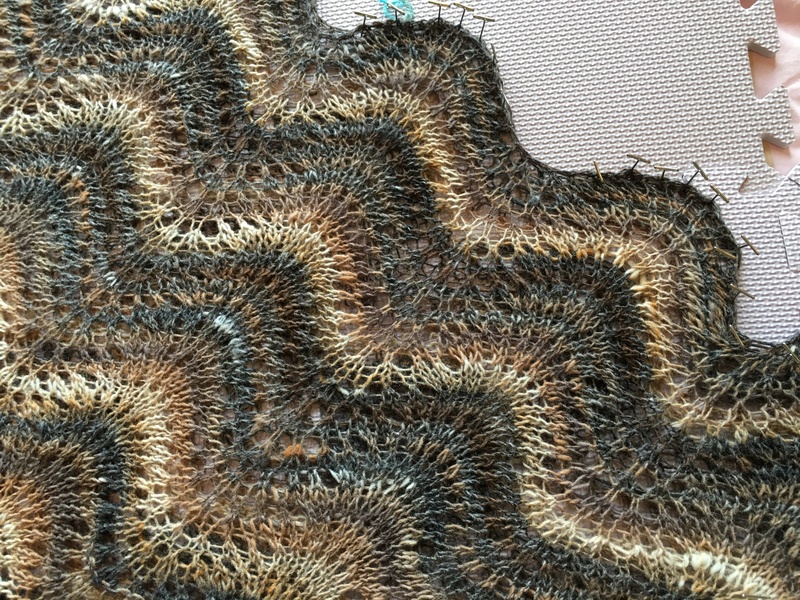 Wet blocking is a transformative process that softens the yarn, lets the stitches settle into place, stretches out and shapes and opens the lace. 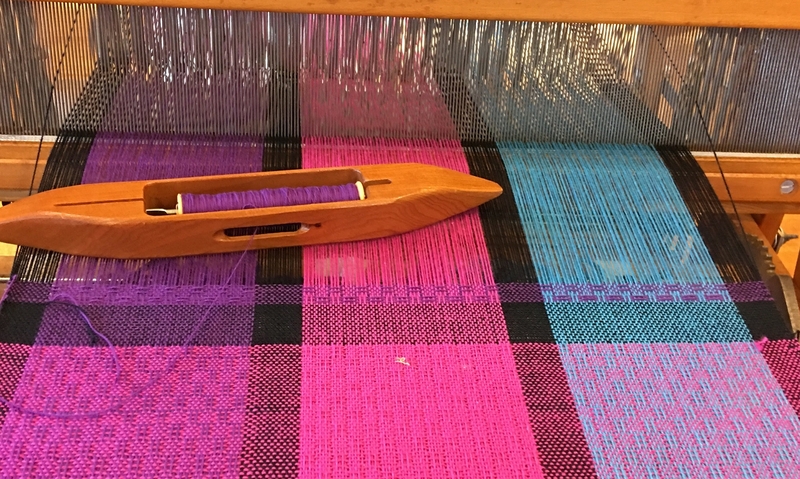 When it is fully dry and you unpin it, the shawl keeps it shape. 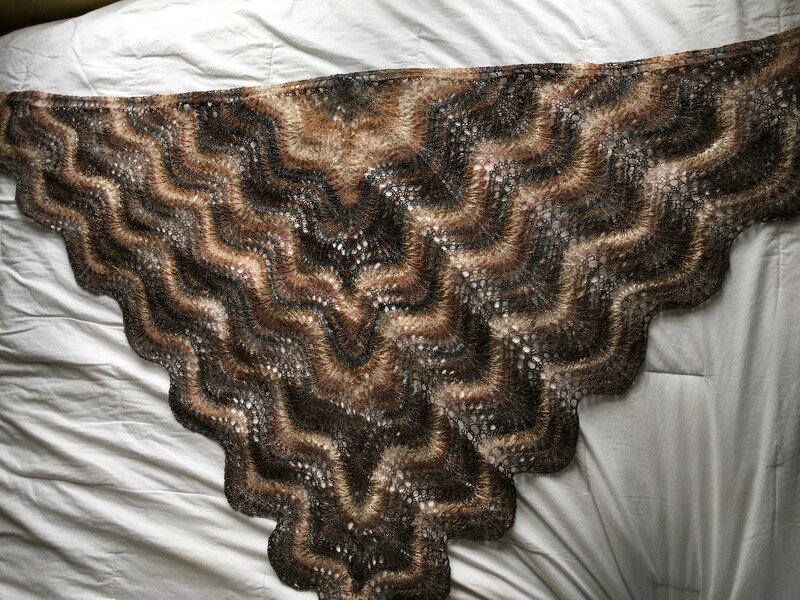 Have I said how much I love Old Shale lace? Socks in progress. 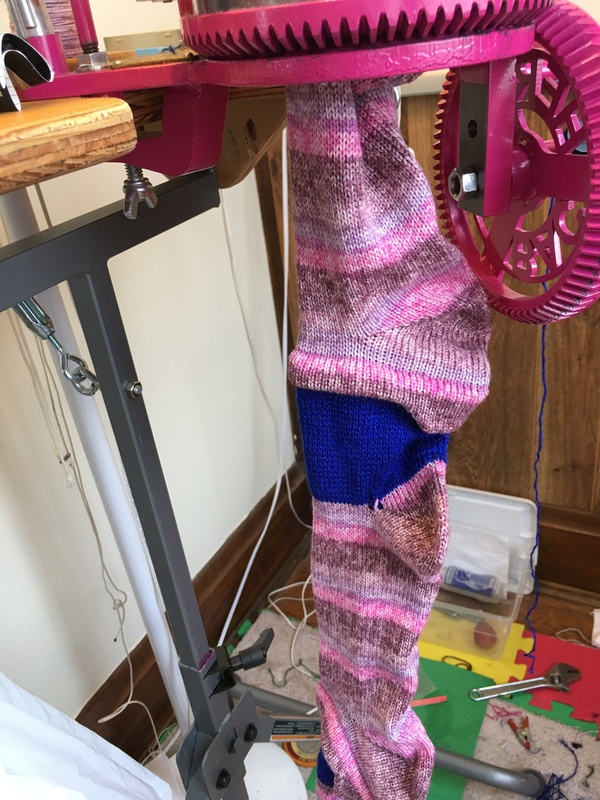 The pink pair is waiting patiently to be removed from the machine and have the toes grafted closed. They will be part of the basket my study group is putting together for a raffle at the Weavers Guild of Greater Cincinnati for the Fiber Arts Fair we are having on April 30. 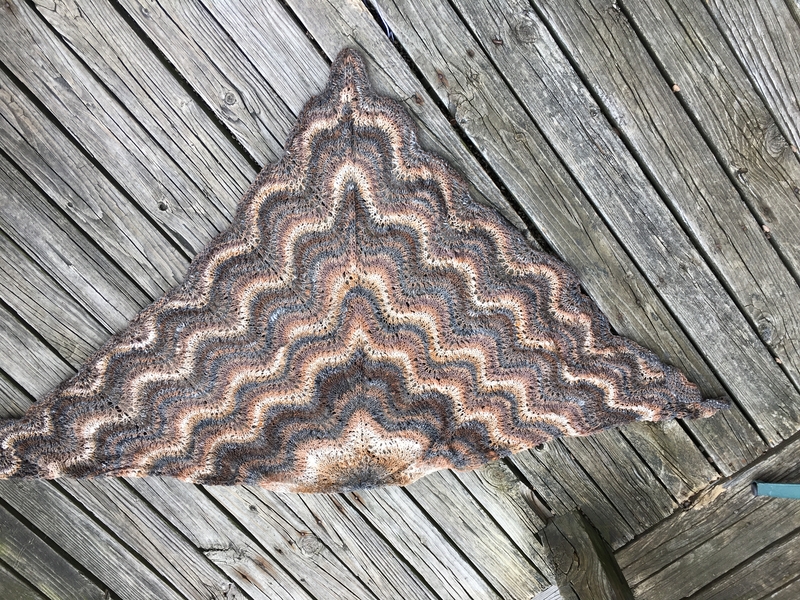 If you are interested in buying fiber art or making fiber art (members will be selling used equipment a tools and extra stash yarn) come to the Fair at the Guild House! I will have cowls, sock and some towels to sell. I also finished up a pair of clogs for my 13 year old son. They were a collaborative effort. I bought the yarn, my daughter did most of the knitting. I finished the knitting, sewed them up and felted them. Here they are pictured with my size 8.5 foot. 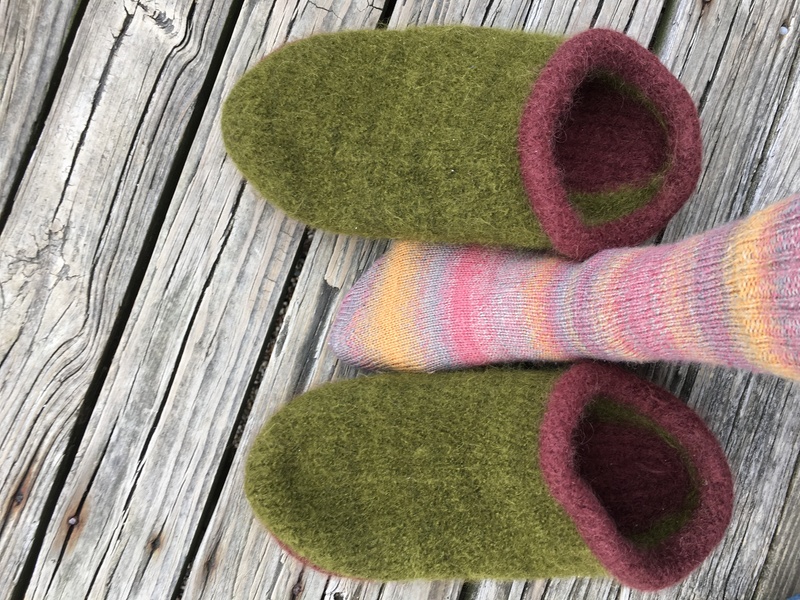 He has outgrown two pairs (grown 8 inches in the last year), here is the first pair I knit Pair 1 and a post when I was working on his second pair. (for some reason I didn’t take a pic after they were finished) so the new ones are bigger than his size 10 feet to have a little growing room.